I have great pleasure in announcing that v2.0 of my Silentype font is now officially released as a New Year gift to the Apple ][ community. I originally made this font so I could recreate my Year 10 Technology magnus opus. I’ve generated versions for pretty well all major modern operating systems – and a few not so modern ones (Mac OS 9 [and prior], I’m looking at you!). …to enable a true open typographic community to spring up and grow. The OFL provides a legal framework and infrastructure for worldwide development, sharing and improvement of fonts and related software in a collaborative manner. It enables font authors to release their work under a common license that allows bundling, modification and redistribution. It encourages shared value, is not limited to any specific computing platform or environment, and can be used by other organisations or individuals. It seemed a good fit for what I was hoping to achieve with my Silentype font. Oh, and if you’re wondering, “Silentype” is officially a “dead” trademark, so I didn’t have any qualms about using it as the actual name of my font. The letterforms were all independently created by me in 2003 and 2004, with recent modifications to accommodate later OS X versions’ predilection to fill in the counters on the letters “o”and “O”, the number “8” and the ampersand (“&”). I recognise what it is about those characters’ counters that is common to them and not with other characters with counters, but I don’t know why that particular attribute caused the counters to fill in current versions of OS X when in 2003 and 2004 OS X as it was then was quite happy to display the characters correctly. Oh, and I’ve added a (very) low-res Apple logo to the font at the appropriate location. I may extend the character set further during January, but don’t have any firm plans on that front at the moment. I used Fontographer v5.2.1 for this version, as I’d used v3.5 to create the original font and I wanted as smooth a path from the original .fog file (rather than being recreated from the generated font files). The .fog file is available upon application. The font is released as a free resource for the Apple ][ and Apple /// communities. I would appreciate a heads-up if it’s bundled with any applications. Please also let me know in the comments if you use the font, or even just if you had a Silentype “back in the day”. Having recently posted about using Apple Writer v1.1 for my Yr 10 Technology assignment, I saw a post in comp.sys.apple2 pointing to an interview with the author of Apple Writer, Paul Lutus. He’s led a varied career, and it was well worth a listen – he talks about his time at NASA, how Apple Writer came to be (and allowed him to retire a second time), his philosophy on life and just what free software is all about to him. His website is apparently worth a look, too, so I’ll be checking that out when I get some time. As previously noted, my curricular time with Bob Bates came to an end in 1983, when he taught the half-term Technology syllabus to all six Yr 10 classes in turn. Our class, 10/1 Science, had Technology first, which I was certainly happy for (I continued to do elective computer classes throughout the year outside of normal timetable classes). The culmination of the course-work was an assignment due in late March (the Australian school year starts in late January and finishes in December) reviewing a personal computer of our choice. By now, the Apple //e had been released, but I’m sure you won’t find it too hard to guess which computer I chose to review – the Apple ][europlus, of course. I threw my heart and soul into that assignment like I had never done before (nor since). I used pictures from the October 1982 National Geographic, which had articles on computer technology and Silicon Valley. I also used photos and information from the Fall 81/Winter 82 Apple In Depth publication (N.B. I appreciate that’s not the greatest scan of the cover, but I don’t currently have a flatbed scanner – watch this space) as well as product brochures and magazine ads. One thing we’d been lacking on the europlus, though, was a word processor. If I was going to do an assignment on the Apple ][, I wanted to do it on the Apple ][. 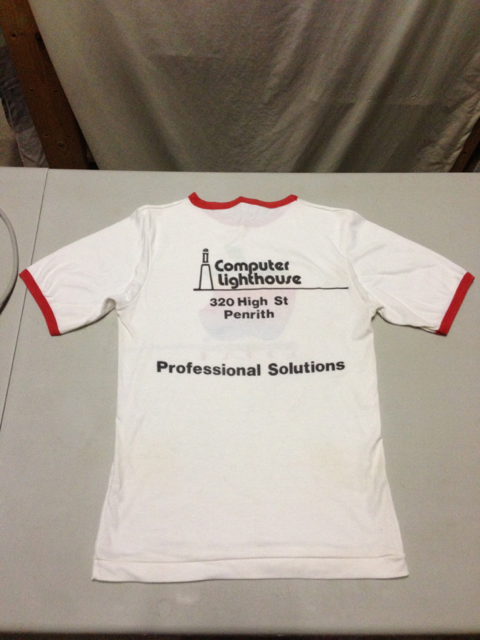 So I ducked out to Computer Lighthouse to select a word processor – I ended up with v1.1 of Apple Writer, which worked around the europlus’ lack of lower case letters by inverting letters that were to be printed in capitals, while non-inverted letters would print lower case. Coupled with the fact the Silentype didn’t descend its descenders, it all felt like a kludge, but it worked. I roped in my sister, who’d done a secretarial college course, and my Dad, who was the source of my pedantry, to proof-read as I revised and printed drafts. Although I had the bulk of the material on hand early, I distinctly remember a mad rush on the weekend before the assignment was due, handing pages to my sister and Dad as they were printed for the next round of proofing. I duly handed in the assignment on time and awaited Bob Bates’ verdict along with the rest of the class. As was my wont, I was sitting at the back of the class when the assignments were handed back – they were handed to the person at the front of each row to be passed back till they arrived at the person who’d written them. I seem to recall an odd smile on Bob Bates’ face as he handed mine to the guy at the front of my row (I could still recognise my handiwork from the back of the room), and, in typical teenage boy fashion, each boy on its way to its rightful owner would flip to the last page to check out the mark – as that happened for the five or six boys in front of me, they’d give me an odd look as they passed it to the next boy in the path to me. When I got my hands on it and checked the last page, I discovered why I was getting all these odd looks. Written in red ink in large numbers and circled was my mark – 100%! And Bob had added a comment – “First class work! Congratulations.” To say this was one of the highlights of my time at school would be an understatement. I’d never felt such a sense of accomplishment. I’d gotten 100% for other things before and have since, but no “top mark” ever felt as “top” as that. It had such an effect on me, I still have the assignment along with the course notes from that last half-term taught to me by Bob Bates. Wanting to recreate the assignment using modern computers was the reason I created my Silentype font all those years ago (watch this space on that front, too!). It probably also helped cement the old europlus in my heart, too – a review of that machine done on that machine that got me 100% from my favourite teacher – who wouldn’t love a machine like that?! 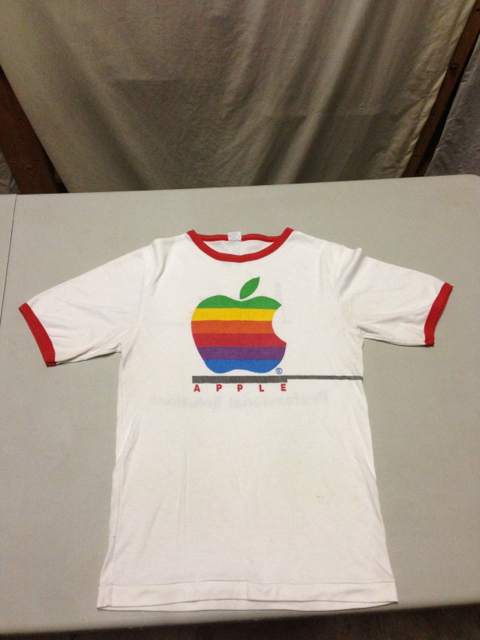 Did you have a stand-out school experience of the Apple ][? I’d love to hear about it in the comments. Some time in 1982, after I’d been using computers at school for about two years, my father decided we should get one at home. He was interested in having something to help him keep track of the tax records for our holiday home on the Central Coast (it was also rented out as a holiday let), and he wanted to create a database of his coin collection. He gave me the task of selecting an appropriate machine – I was, after all, the only member of the family with any experience with personal computers at this point. Initially, because of my experience with them, I looked at Tandy’s TRS-80 offerings. This was in the days of the original TRS-80 Color Computer, and I distinctly remember looking at Tandy brochures expounding the virtues of these machines. I find it amusing that my clearest recollections of the decision-making process are of considering the computer I ultimately decided not to get! Unfortunately, I cannot recall just what it was that made me settle on the Apple ][, but settle on it I did, and Dad duly forked over what was likely to have been a huge wad of cash (or, more likely, he put it on his Bankcard, Australia & New Zealand’s own little credit card) for a 48K Apple ][europlus with a third party 16K memory expansion/language card, third party green screen monitor, a commodity dot matrix printer, two Disk ][ drives, pfs:file and pfs:report database programs and not much else. We bought it from our “local” (30 minutes’ drive away) Apple dealer, Computer Lighthouse at Penrith (which is at the Western outskirts of Sydney at the foot of the Blue Mountains). I of course got to play a lot of my friends’ Apple ][ games (perhaps, more correctly, Apple ][ games my friends possessed) – I particularly enjoyed Castle Wolfenstein and Beyond Castle Wolfenstein, Lode Runner and Championship Lode Runner, FastGammon, Sabotage, Karateka and an Applesoft BASIC Star Trek clone. Having never been a particularly enthusiastic (or good) chess player, I toyed with Sargon (or one of its successors), but the only memorable thing about any of my computerised games of chess is that immediately after a successful use of a slight variation of the “Two-Move Checkmate“, the Apple ][ blew up! Well, it was probably just a blown capacitor (it was thankfully still under warranty), but one of my brothers and I used to joke that the computer was just a sore loser! The dot matrix printer was not a high quality one and didn’t last long – by March 1983 it had been replaced by an Apple Silentype printer. Along with the addition of a joystick at some point, that remained our computing setup at home until late 1985. I used it for school timetables, started toying with fonts and graphics as a prelude to my desktop publishing career, but mostly I just played on it. I spent uncountable hours in front of the europlus, and it obviously holds a lot of nostalgic value to me as my IRC nickname in #a2c.chat is “europlus” (on the rare occasions I make it in there) and, as you’ve possibly already noticed by now, it is also this blog’s name. When I started collecting Apple ][s, my goal was always to get another europlus and get as close to that original setup as possible. I’m mostly there, but am still awaiting a reasonably local and reasonably-priced working Silentype and the interface card required for it to work on a ][. I’d be interested to hear how others chose to get Apple ][s, what the setup was and whether they kept their original machines or have had to “recreate” their ][ systems. It’s probably good to get this post out of the way early on, rather than it languishing in the todo pile of an abandoned blog (I’m realistic about the number of blogs that successfully carry on long-term, here’s hoping I buck the trend). As I’ve touched on in my introductory post, my true introduction to using computers (as opposed to just being fascinated by them) came when a kindly teacher at my high school took it upon himself to teach Yr 7 (first year of high school) students about computers. In 1980, Patrician Bros College, Blacktown had a grand total of 1 computer. 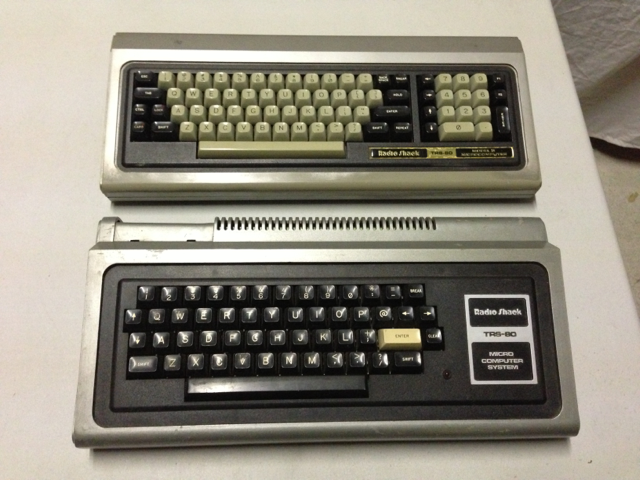 It was a TRS-80 – if my memory serves me well, it was a Model 1 with expansion module, floppy drive/s, cassette recorder and matching monitor (and likely matching printer). Up to this point, only Yr 10 students were allowed use this machine, so we felt pretty special to have access to it in the group of 4 or 5 of us who had put our hands up in class. As an aside, the school at that time had students from Yr 5 through to Yr 10, so the last 2 years of Australian primary school, and the first 4 years of high school. Other schools were responsible for finishing the schooling if students decided to go beyond the School Certificate in Yr 10 and attempt the Higher School Certificate in Yr 12. Never understood the reasoning for this fairly oddball (by most Australian standards) range of years – it got “corrected” in the 90s and now has students in Yrs 7-12, the more standard Australian high school range. So our self-selected group learnt to program in BASIC on the school’s “Trash-80”, a name we soon learned, and one which I later learned was almost universally applied. But to us, it wasn’t really trash, it was magical, because we could make it do our bidding, and the magician to our apprentices was Robert “Bob” Bates, then known to us students only as the more formal “Mr Bates”. Bob Bates was ambidextrous – he would turn from the chalkboard, place the chalk in the hand he hadn’t been using, expound on something, turn back to the board without putting the chalk back in the hand he’d been using, and pick up writing where he’d left off. Buggered if I could ever pick the transitions from right to left or back again when looking at the full board later on. Mr Bates wasn’t “cool” and trying to be our best friend. He had a calm reserve I only ever saw broken once. He had a ready smile when talking about topics he was passionate about (primarily technology in those days). He cared deeply about his charges and took his responsibility in helping to positively shape our lives very seriously. His nickname amongst the students was “Bunge” (pronounced “bunj”). He drove a Leyland P76 (to date, the only person I have personally known to have done so [it was a distinctive and memorable car]). Through those early lunchtime sessions in Yr 7, then as my Science teacher in Yrs 8 and 9, Bob Bates helped me learn a lot about computers (and science in general) and kept my passion for technology alive. I would have liked to have had him as my Science teacher for the whole of Yr 10, but the school had the “bright” idea of splitting each of the three terms in two and having the six separate Science topics taught by different teachers. Unsurprisingly, Bob Bates taught us the Technology curriculum. Also unsurprisingly, he taught it in a way I think few other teachers in 1983 would have (I suspect, though, that readers of this post who were at school before the widespread use of computers but who got to use and learnt to love computers at that time, may have had their own “Mr Bates”). He taught us not only about computers as they were then, but offered us glimpses of a time when devices would converge, robots would take over many of manufacturing’s less savoury tasks, and employees would move to become what would now be called “knowledge workers”. It was our duty to ourselves, he taught us, to not rely on employers to keep us “trained up”, but to do that ourselves by pro-actively reading trade magazines in our chosen fields and undertaking training to keep us ahead of our peers. He saw that those workers who embraced change and lead it by being part of it would be the workers who would benefit the most from it and not be left behind. I’ve not necessarily led the most successful career in computers, but I’ve been kept off the streets, have my own business, and continue to enjoy the constant evolution of my knowledge of computers. I feel I owe a great debt to Bob Bates for helping me get my head in the right space for keeping my skills and knowledge growing. Epilogue: some years after leaving school, I learnt that Bob had moved to the States. I’ve tracked him down 3 times now (it’s not stalking, I promise!) – in some ways, it gets easier each time, as the Web makes such tasks straightforward if the “target” isn’t actively trying to hide. A few years back Bob was visiting Australia and we got together, giving us a chance to meet each other’s wives, which I was happy for (my wife got to meet a seminal figure in my life, his wife saw the continuing regard I held her husband in 20+ years later). He’s currently on the staff of a Bible College, and also (I’ve discovered since starting to write this post) sells his paintings online – I never knew he was so artistically inclined (or talented). Quite the polymath, is Mr Bates. 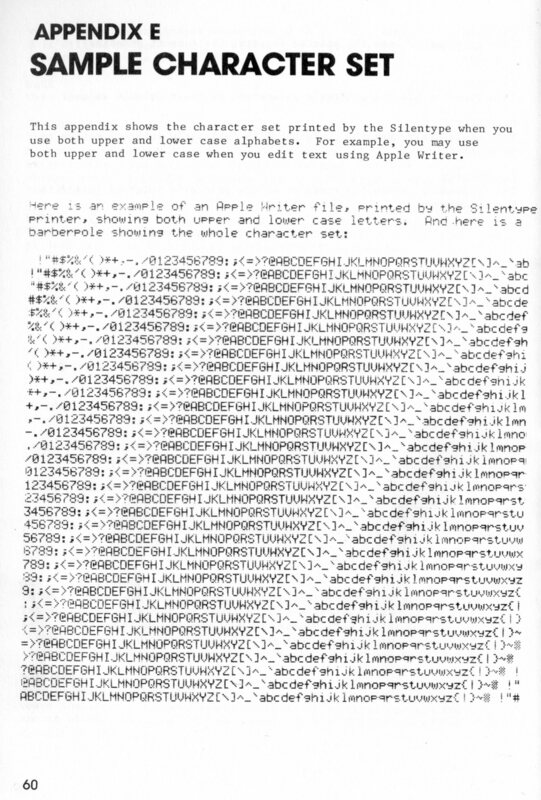 For reasons which will become clearer after a few more backstories (I thought I should post something “useful”), I set out in September 2003 to create a font of the Silentype character set for modern computers. I had a copy of Fontographer I had previously used for logo font creation I could use to make the font, but I didn’t have enough samples of the character set of the Silentype to be able to do as full a job as I would have liked. So I turned to Usenet (most readers of this post won’t need, I suspect, to be told by Wikipedia what Usenet is – but it’s there, just in case) and received various replies trying to help locate a printout of the complete set or confirming my interpretation of the technical documentation on how the character set was generated on the original Silentype. While waiting for the hoped-for complete character set sampler from a real Silentype, I went ahead and made a font with the characters from printouts I had from “back in the day”. I was short at least 16 characters, though, so I also went looking for any references to current owners of Silentypes. Direct appeals went unanswered, leading me to widen my net further to the forums (I always want to type “fora”) at Erik Klein’s Vintage Computer site. Still no joy. 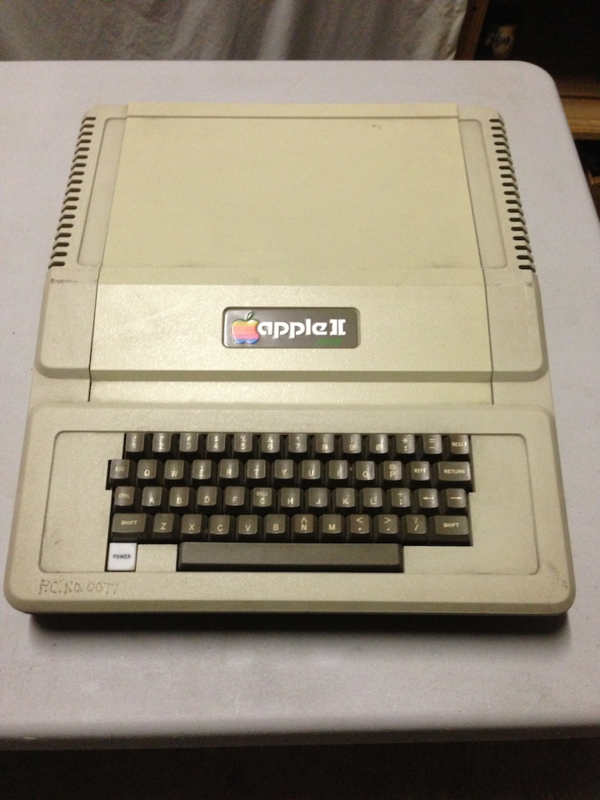 But in an object lesson on keeping an open mind when trying to create resources like this, I noticed in late February 2004 an eBay auction of several Apple ][-related manuals, including a Silentype one! I fired off a quick e-mail to the winning bidder, one Cristophe Janot, who very quickly (and kindly) not only confirmed that the manual had a sampler of the Silentype character set, but happily provided a scan of same. Eight years after completing the font, I began to consider creating a Motter Tektura font, and that made me think back to my not-officially-released Silentype font – I typed up some characters and noticed OS X is now rendering “o”, “O” and “8” with filled-in counters. So I’ll have to revise the font, and announce and release it then, but it’s available in its current form to anyone who wants it. It seems to work fine in Windows XP, and I’m not sure which version of OS X “broke” the counters, but I’m sure I’ll be able to fix it at some point. Let me know if you have any recollections about the Silentype in the comments.